Note: This is a sponsored post is collaboration with Easyship. As an ecommerce business, one of your greatest opportunities is being able to sell to customers all over the world, and you need a shipping carrier that can help make that possible. However, every shipping carrier operates differently when it comes to their shipping rates, dimension requirements, locations they ship to and even how fast they can ship parcels so it can be difficult to find one shipping carrier that does it all the way you need them to. 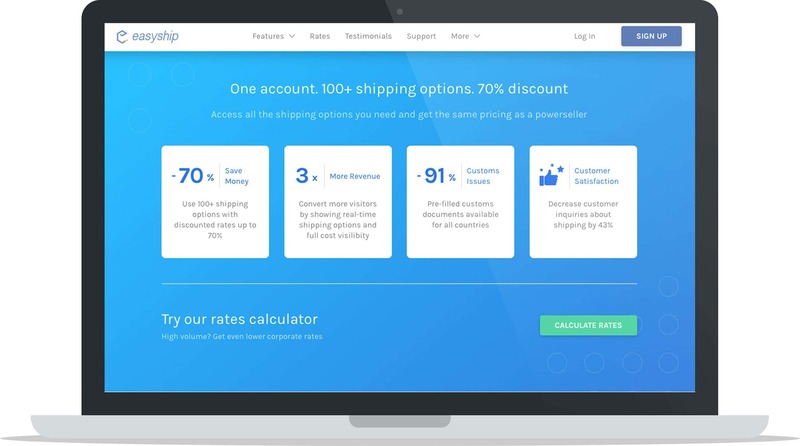 Easyship helps ecommerce businesses find a solution to this problem, and in this Easyship review we’re discussing in detail what they do to make shipping worldwide as easy as possible for ecommerce retailers. Easyship removes the last barrier in the ecommerce process that all ecommerce businesses face: Shipping. They make it possible for ecommerce businesses to ship their packages as quickly and inexpensively as they can, and they do this by partnering with over 100 shipping carriers so every package can be shipped at the best and fastest shipping rate possible. Before Easyship, ecommerce merchants had to contact each shipping company individually, negotiate shipping rates, sign a contract, pay a deposit and reconcile invoices for each courier. 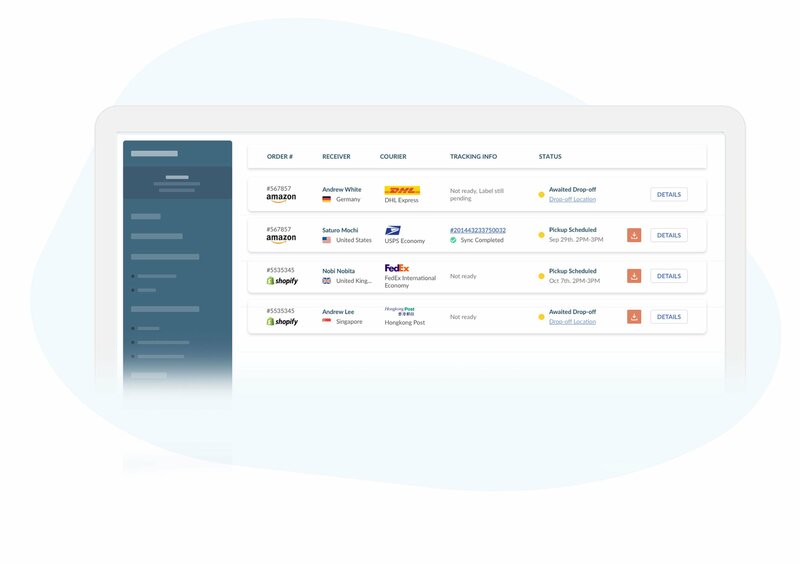 With Easyship, you can use more than 100 different shipping options to ship your packages from one dashboard, in one click, without having to negotiate rates, pay upfront deposits, reconcile invoices or be bound to a contract. They offer a one-stop shipping solution for any merchant looking to grow their business. With the service they provide they’re able to offer up to 70% discounted shipping rates, so they’re a more cost-friendly option to ship with, and they also offer businesses full visibility on international shipping rules and regulations so there’s no surprises when it comes to taxes and duties. 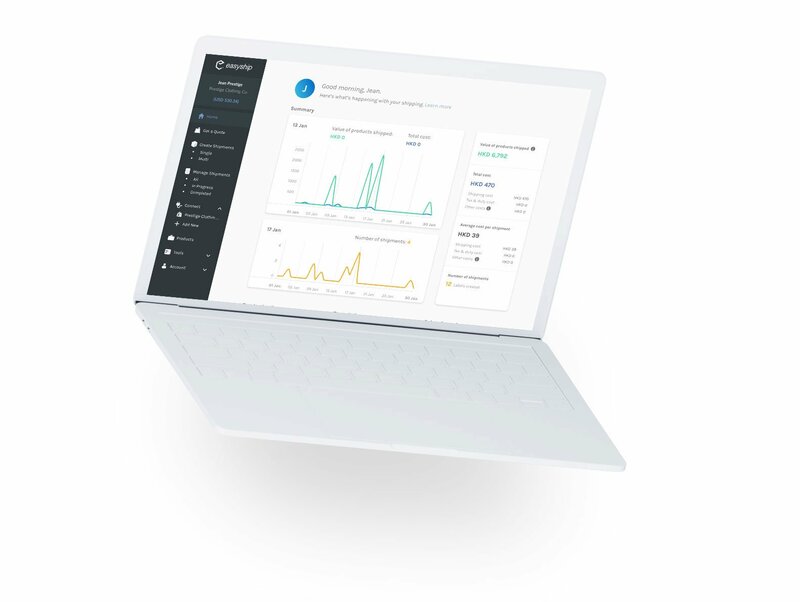 They do all of this from one dashboard that also integrates with major ecommerce platforms like Shopify and marketplaces like Amazon, so it’s easy for merchants to manage. 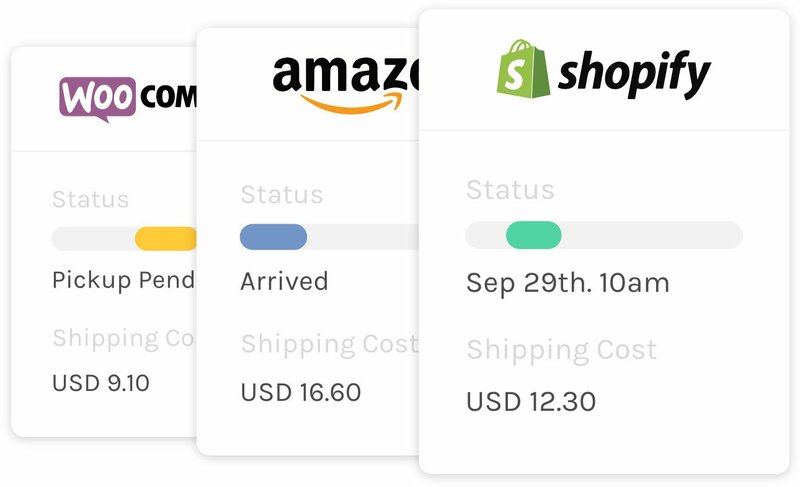 In short: Easyship gets you competitive shipping rates and shipping times with all available shipping carriers worldwide all in one dashboard that connects directly to your ecommerce store. Easyship is for businesses that want to sell worldwide, which, should be every business. If your business isn’t prepared to sell around the world then you’re missing out on valuable customers and sales. Easyship is also for the business owner who doesn’t have the time or resources to learn about shipping from the inside out. With so many shipping carriers around the world that operate by different practices, and with so many shipping rules and regulations to be aware of, it can be hard to keep up. Easyship is an all-in-one shipping platform that handles the entire shipping process from sourcing the best carriers to ship with, finding the best shipping rates, generating all necessary shipping labels and documents and calculating shipping taxes and duties. You really don’t need to know much about shipping when you use Easyship, they handle everything for you. Easyship is one single platform that allows you to connect with multiple shipping carriers on demand so you can be flexible with your shipping options to get the best price at any time. Shipping prices depend on so many factors such as package weight and distance, they vary from carrier to carrier and they can change at any time, so with Easyship’s service you and your customers get automatically calculated shipping options drawn from over 100 shipping carriers so you get the best option at the time of shipping. By using Easyship’s real-time Rates at Checkout feature you can reduce abandoned carts as you’re able to give customers the choice of picking the cheapest, fastest and best value shipping option so they can tailor make the shipping rates to suit their needs. With this flexibility, customers have full price visibility which gives them the lay of the land and the information they need to make a well-informed purchase. Based on an internal survey Easyship conducted with their clients, this feature also helped merchants increase revenues on international orders by up to 300%, reduced shipping costs by up to 70% and decreased issues at customs by up to 91%. With Easyship, you’ll also never overspend or underspend on shipping because all rates, taxes and duties are calculated on-demand, so they’re never an estimate of what the actual cost is. Best of all, Easyship is free to use and there are no setup, subscription or cancellation fees, you just pay the shipping costs. All of Easyship’s features and services revolve around making shipping worldwide easier, cheaper and more efficient for both you and your customers, and also customizable so you can tailor them to your specific needs and preferences. Let’s jump into everything Easyship can do for your ecommerce business. The star of Easyship’s services, their Rates at Checkout feature is the solution to your worldwide shipping woes. This feature enables you to provide the best available shipping options for your customers based on their location and shows all associated costs such as taxes, duties and handling upfront for every country in the world to prevent abandoned shopping carts. Many ecommerce stores use static shipping rates based on their carrier’s suggestion, however, this can be detrimental to your overall shipping strategy because they don’t show the whole picture. Shipping costs fluctuate, and so static shipping prices can only be an estimate of a shipping cost at any given time. This can cause ecommerce stores to overcharge or undercharge shipping rates which can have an effect on their bottom line, or result in abandoned shopping carts. 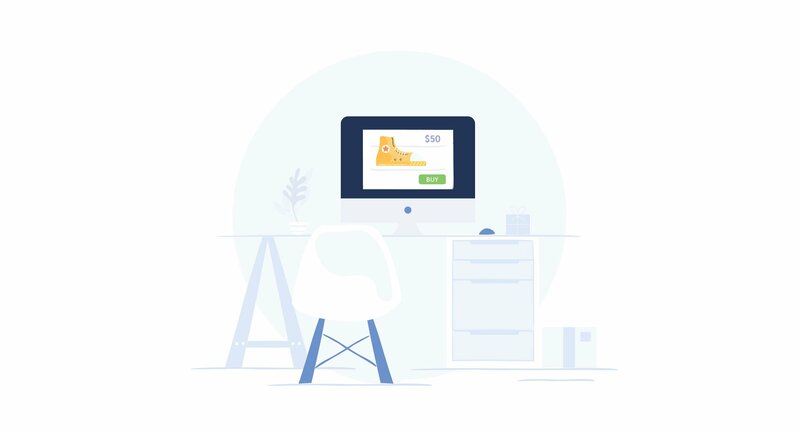 With Easyship you don’t have to figure out how to correctly charge your customers for shipping every time they make an order, Easyship calculates it on demand and shows the exact shipping cost options to your customers so it’s never an estimate. With the Rates at Checkout feature your customers will be shown three rates to choose from as they check out: The cheapest shipping rate, the fastest shipping rate and the best value rate (the least expensive rate that will arrive in the shortest amount of time). These rates are calculated automatically, at the time of order, from over 100 different shipping carriers worldwide to ensure the best option for the customer. Additionally, customers can see the courier’s performance rating, which is between 1-5 stars. This rating is taken from data that Easyship has collected over the years from actual customers who have used the service. If, however, the Rates at Checkout feature doesn’t suit your business’ shipping process, you have the option to deactivate the feature after installing Easyship. 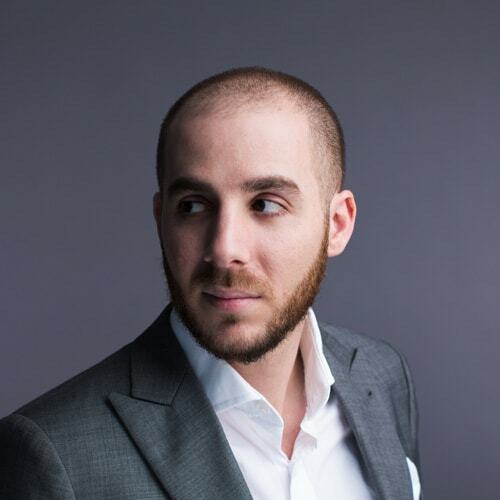 It’s also important to note that if you’re a Shopify merchant, you’ll have to be on an annual Shopify plan or the Advanced Shopify plan or the Shopify Plus plan to utilize this feature. Easyship’s focus is shipping, so it’s no surprise that they provide an array of shipping services and features to help make your business’ shipping process easier and more streamlined. 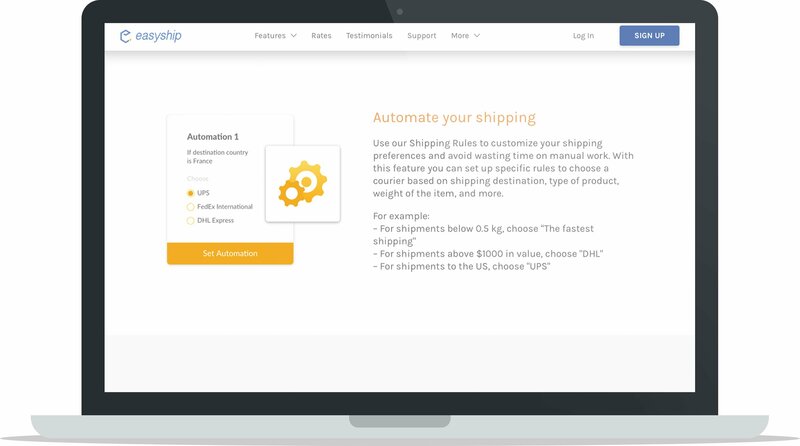 3 Options to Create Shipments: Fill out shipping details for individual shipments as you get them, upload an Excel file with your orders, or sync your store with Easyship and download your orders in one click. Instantly Compare Shipping Rates: For each shipping carrier Easyship will show you the delivery time, tracking frequency, insurance and number of delivery attempts they offer. Generate All Your Shipping Documents: Including shipping labels, shipping documents and commercial invoices so every package is declared properly to minimize and prevent delays at customs. Schedule Courier Pick Ups: Contact shipping carriers online right from the Easyship dashboard to choose your pickup time and location. 100+ Shipping Solutions: Compare and choose from over 100 worldwide shipping carriers like FedEx, USPS, DHL, UPS and more. Save on Shipping Costs: Easyship negotiates with shipping carriers so you get discounted rates on shipping. No Hidden Fees: There are no added or surprise fees, bills or costs, when it comes to using Easyship’s service. All pricing is transparent so you’re never left with a surprise expense to take care of. One of the most complicated aspects of shipping worldwide can be taxes and duties. As an ecommerce store, it can be difficult to keep up with the taxes and duty requirements for each country as they’re different from country to country, and depend on the type of product and value of the shipment overall. Easyship automatically determines the taxes and duties for each of your international shipments so you don’t have to. Not only that, another major feature to note is that you’re able to decide who pays the customs charges, taxes and duties. Either your business can pay these charges, or your customers, you simply choose which option suits you best with a few clicks. 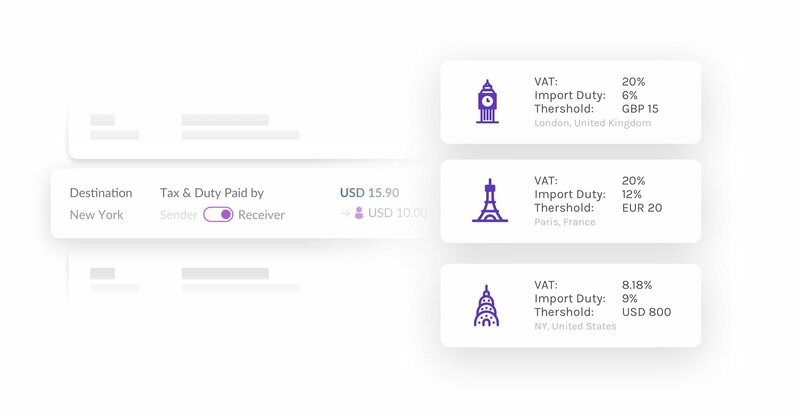 Taxes and duty charges, while not only complicated for merchants, can be a deterrent for customers, so by using Easyship you can ensure that your customers will never have to pick up the customs charges tab, enabling them to feel more confident in their purchase and less likely to abandon their shopping cart. Easyship is built for ecommerce merchants, so you can be sure that their service is optimized to suit your needs. Sync Easyship directly with your store whether you’re selling on ecommerce platforms like Shopify, BigCommerce, Magento, WooCommerce and more, or marketplaces like Amazon, eBay, Etsy and more. With this integration, your orders will automatically sync so you don’t have to manage everything manually. Learn more about all of Easyship’s ecommerce and marketplace integrations here. With their platform integrations, Easyship also automatically updates tracking information to your dashboard. This means that you can get an overview of tracking numbers and courier names at a glance, plus send automated tracking emails to your customers so they’re always informed of their order’s whereabouts. With Easyship, you can use multiple couriers to ship your packages around the world without having to create multiple accounts and manage your accounts across multiple websites. 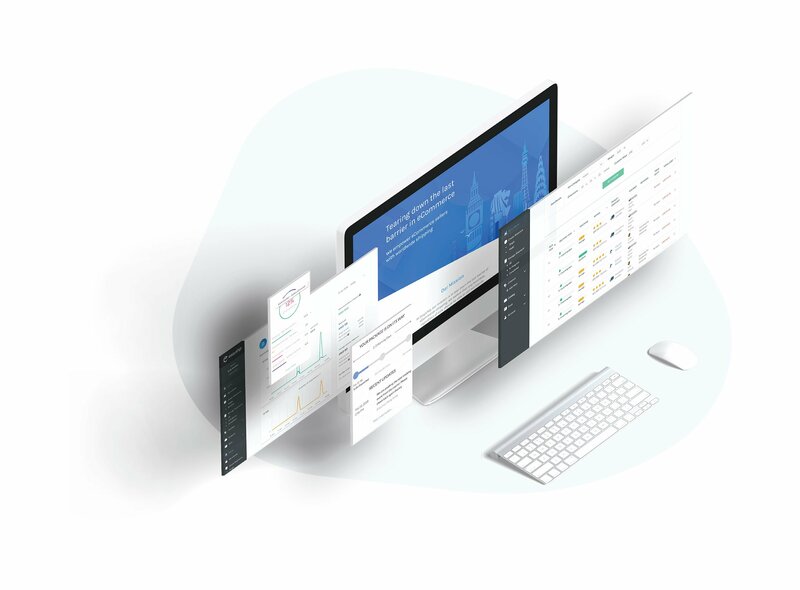 You’re able to operate your entire international shipping process from one centralized shipping dashboard that integrates directly with your ecommerce store and automatically updates itself so you’re never having to manually update orders. This makes your entire shipping process more streamlined and easily manageable. 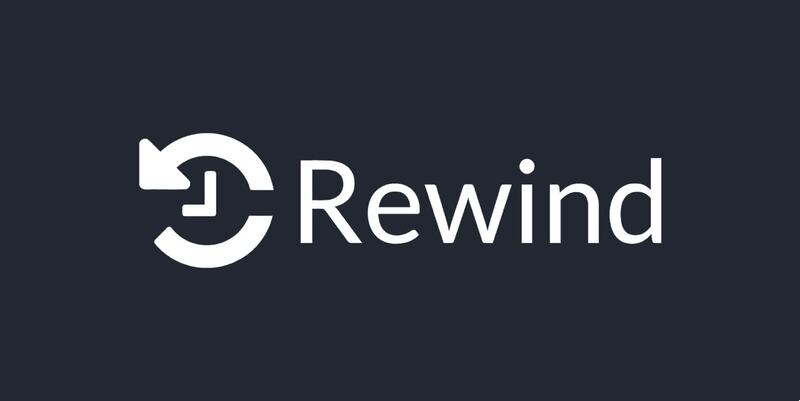 It allows for fewer errors to be made and ensures that every order is documented in one place should you need to review anything. It also means that you can get a clear overview of orders at a glance whenever you want to, so you can oversee your shipping process from a bird’s eye view. 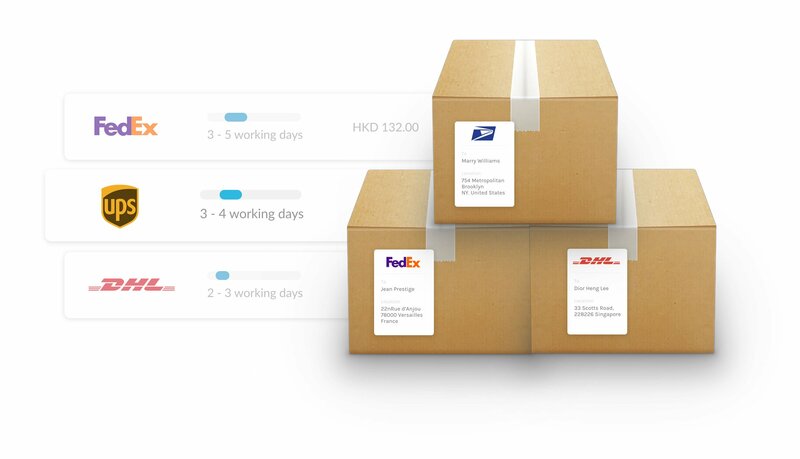 Immediately from order creation until your package is in the hands of your customer, all shipping information for your entire store is in one organized place, including full visibility on shipping costs, couriers, courier rating based on actual performance over the years, taxes, tracking numbers and delivery times. Every ecommerce store is different, and Easyship gives you the opportunity to tailor your shipping requirements to fit your process. You can do this by taking advantage of their shipping rules. Easyship’s shipping rules allow you to customize your shipping preferences so you can select a specific shipping carrier to use based on details like shipping destination, type of product, weight of the item and more. This means that if you prefer a shipping carrier over others in certain circumstances, you’re able to automate a selection so anytime the conditions are met, your customized shipping rules come into effect. The main advantage of using Easyship is being able to ship with various shipping couriers without creating separate account setups. Each shipping carrier has advantages and disadvantages to their service, and Easyship helps ecommerce businesses utilize more of the advantages when it’s best applicable. In order for your customers to make use of the real-time rates at checkout feature on Shopify, you’ll need to have an annual Shopify plan, or be on the Shopify Advanced or Plus plans. Easyship is free to use. There are no set up, subscription or cancellation fees, all you’re required to pay is for shipping and any relevant customs or duties charges. As we’ve touched on throughout the course of this article, Easyship stands by their transparent pricing, and ensures that all shipping related costs and fees that you or your customers are required to pay are presented up front so there are no surprise expenses, ever. If you’re interested in learning more about the shipping prices Easyship makes available for you, check out their Shipping Rate Calculator. It allows you to customize your requirements so you can get accurate shipping rates calculated on demand. Don’t waste precious time trying to figure out which shipping carrier has the best rates and the best shipping times, with Easyship you can use shipping carriers from all over the world, whenever it’s the most cost-effective and time-friendly option, all from Easyship’s platform. They’re a single solution that reduces the frustration of hunting down the best shipping couriers and they make shipping worldwide easier so every ecommerce store, big or small, can ship to customers worldwide. Good review but it’s seems to be available only for customers based in the US, Hong Kong or Singapore? I am based in Belgium and would be interested in this service, any other option/software to recommend? Thanks! Hi Adrien! You are correct, at the moment only customers based in the US, Hong Kong, and Singapore can use our service. We hope to be in Belgium soon! It would be great to get visibility of your roll out plan as we are sourcing from lots of different countries.